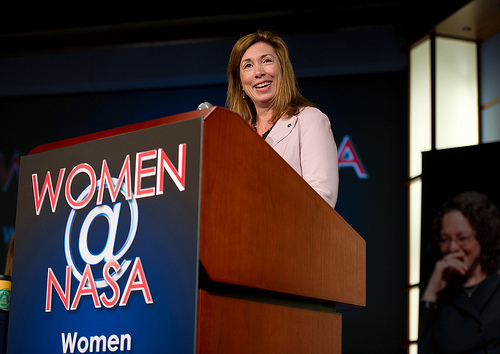 NASA’s March 8 “Women@NASA” conference was a pleasant surprise. It really was all about women at NASA, and women-at-NASA-to-be, their status and their accomplishments, free of sales pitches for new Space Launch Systems or the International Space Station or human missions to anywhere. Looking around the Jack Morton auditorium at George Washington University in Washington, D.C., I saw that all seats were filled, women outnumbered men by close to 100 to 1, and I was one of a small minority of white women in attendance. One positive change at NASA that Administrator Charlie Bolden and Deputy Administrator Lori Garver have received little to no credit for in the aerospace community is public recognition of the significant presence of female and minority employees at the agency, which has greatly improved morale, especially at NASA headquarters. Until Bolden and Garver arrived at NASA, it was all too common, and often with good reason, for women and members of other underrepresented groups to feel invisible at NASA. These two have done a lot to turn this sad situation around, and I thank them for their efforts. My thanks have nothing to do with NASA or space exploration or the fact that I voted for Obama. I thank them for advancing social justice. In her opening keynote at last week’s conference, Garver showed her true colors as an advocate for social change. Government bureaucracies are “structured to protect the status quo,” she observed, which in her judgment requires change. So how do we effect change? In 1968, NASA held a “Miss NASA beauty contest.” In 1970, a (female) NASA Goddard Space Flight employee wrote a memo to all “Goddard gals” about the propriety of women wearing pants to work, concluding that it was okay as long as it didn’t offend their male bosses. “We cannot allow ourselves to be treated this way,” Garver said, choking up a bit. Where are the pantsuit memos of 2012? She asked. Where does NASA need to work on being more inclusive? NASA’s workforce of 18,000 people includes 6,000 women. Garver’s message was that while women have made a lot of progress at NASA since the 1960s, they have not obtained equity. And until women achieve equity at NASA, she asserted, women’s work is not done. Only 20 percent of NASA’s engineers are female, and only 22 percent of NASA STEM jobs are held by women. Only 29 percent of NASA’s leadership is female, and only 6 of 40 members of NASA’s senior management team are women. No NASA Mission Directorate chiefs or NASA field center directors are female. Kathy Sullivan, one of the six women in NASA’s first class of 35 shuttle astronauts (1978) and now deputy administrator of the National Oceanic and Atmospheric Administration, said that NASA had proposed establishing a dress code for the women in this group but not for the men. Sullivan’s message was that women are different, and we bring these differences into the work place, and work places should value rather than discount these differences – for example, women’s tendency to be more collaborative than competitive, assertive rather than aggressive. Kamla Modi, an analyst with the Girl Scout Research Institute, reported on a recently completed study, “Generation STEM: What Girls Say About Science, Technology, Engineering, and Math,” based on focus groups and an online survey conducted with girls aged 14-17. Some findings: 74 percent of girls surveyed said they are interested in STEM. Why? Because they want to know how things work. While 81 percent of STEM-interested girls said they are interested in STEM careers, only 13 percent said STEM is their first choice. One way to narrow this gap, Modi said, would be to provide girls more exposure to people, especially women, in STEM careers. The situation is worse for African-American and Hispanic girls, she noted, as they have fewer role models, less encouragement, and less exposure to STEM fields than other girls do. During Q&As, two young women affiliated with Larouche PAC took to the microphones to complain about President Obama’s space policy. Both accused the administration of “killing humans to Mars,” and one asked what opportunities women could possibly have to “innovate at NASA” under current space policy. Bolden and Garver disabused them of their notions (and rightfully so). I talked to a number of seventh and eighth grade African-American and Latina girls who were in attendance at “Women@NASA,” asking what they’d learned and liked best at the conference. They told me: don’t give up, don’t accept stereotyping, do what you want to do no matter what others may say. I asked them what they were interested in doing or studying when then graduated from high school. They told me: chef/teacher, cardio-thoracic surgeon (geeze…), veterinarian, computer scientist, engineer…. If we continue to encourage and educate girls, and boys, the world may very well turn out to be a better place than it is today.